Become a true pasta master. We can all agree that pasta is a total gift, right? But can you even call yourself a true pasta lover if you've never made pasta from scratch? I mean, you can. But you're definitely missing out. Making pasta from scratch may seem intimidating — but it's actually not that hard if you have the right guidance. It's also a fun activity and you only need four ingredients total: flour, salt, eggs, and olive oil. 1. Pick the right flour for what you want. • 00 flour is the most traditional one and also our favorite. It's super fine and gives a great texture to the pasta. If you can find it, we recommend you use that one. • Semolina is also used in some traditional recipes. It's a bit harder to work with but it does give a more al dente texture to the pasta. • All purpose flour (or AP flour) is also totally fine to use. We developed recipes for all three flours so you would know what to do once you've decided on a flour. 2. After you dump the flour on your counter, form a large well with your hands — emphasis on LARGE. That's where you're going to pour the eggs to mix everything together. Trust us, because we learned this the hard way: you need a large well for this if you want to make sure the eggs don't leak out. 3. Pour the eggs and the oil (lightly beaten together) into the well, and slowly whisk the eggs with a fork to incorporate the flour little by little. This will ensure you don't get any big lumps in your dough and that everything gets mixed in homogeneously. 4. If you get a breach and the egg starts leaking, don't panic. Try to contain it and keep mixing everything and incorporating the flour into the eggs little by little. 5. Once the dough is starting to come together, it's time to knead by hand. 6. At this point the dough should be malleable but not too sticky. Your hands shouldn't be covered with sticky dough once you start kneading. If your dough is too wet, just add a little flour so it's easier to handle. If your dough is too dry and crumbles instead of coming together, the easiest thing to do is mix an egg with a bit of water and sprinkle some of that mixture on the dough. That should evenly add moisture throughout. 7. The biggest mistake you can make? Not kneading the dough long enough. Don't get lazy! You need to really go for it for about 7 to 10 minutes to develop the gluten and get a smooth, well-incorporated dough. Think of it as your workout for the day. Both are equally great, so pick whichever suits you best. 10. To check if your dough is ready, poke it. If it springs back, you're done kneading. 11. It's time to wrap the dough in plastic film and leave it to rest for an hour. You want the gluten to rest for a little so it's a bit less elastic. Otherwise, when you roll out the dough, it'll spring back to its old shape and we don't want that. 12. When it's time to roll out the dough, divide it in smaller pieces to make it easier to handle. 13. And make sure to cover the pieces you're not rolling out first with cling film so they don't dry out. I've learned this the hard way, believe me you don't want to skip that step. 14. 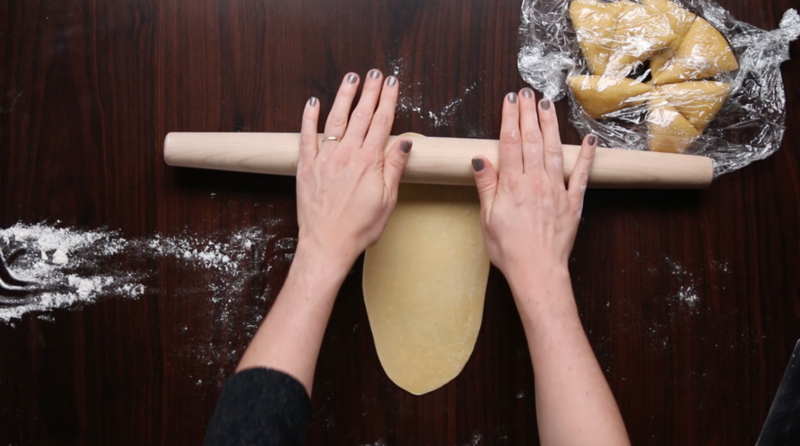 You can roll out the dough with a pastry roll or with a pasta maker. The first option is obviously more labor intensive and you may not get as thin a pasta as with a pasta maker, but it's totally doable, can yield great results, and is actually kind of fun. Repeat this step in between the first few times you roll out the dough. 16. By the time you're done, the dough should be super thin. Some say you should be able to read a love letter through it. That may be a bit extreme, but you should at least be able to see your hand through it. The pasta will thicken when it cooks so if it's not thin enough at this stage, you'll end up with very thick pasta. 17. To cut the pasta evenly, fold it onto itself a few times to form a roll, and slice it this way. Just make sure to immediately loosen the pasta once it's cut so it doesn't stick to itself. 18. When it comes to pasta shaping, have fun and experiment if you feel like it. 19. 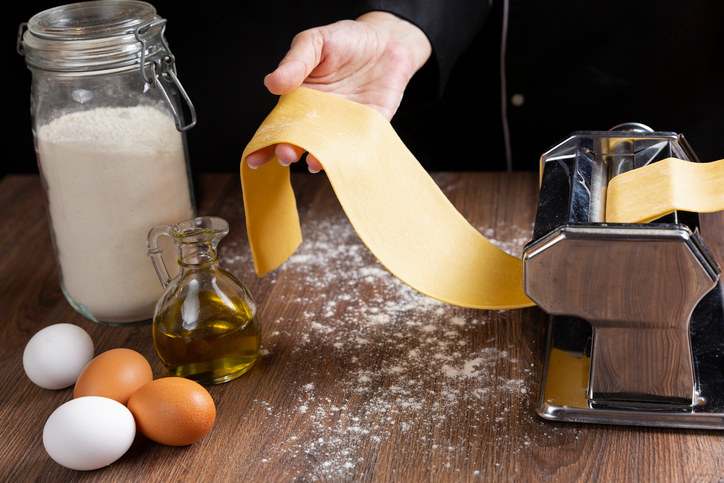 Once you've shaped the pasta, dust a little flour on it so it doesn't stick to itself while it waits to be cooked. It'll also dry out the pasta a little which will improve the final texture. 20. Since the pasta is fresh, it requires a much shorter cooking time. Just put it in a pot of boiling salted water, give it a good stir, cook for 2-3 minutes and you're good to go. Serve with any sauce of your liking and enjoy! On a clean, sturdy work surface, turn out your chosen flour(s) and salt and make a large well in the middle with your hands. Whisk the eggs, egg yolks, and olive oil together in a medium bowl until combined, then pour the mixture into the well. Using the same fork, whisk the eggs, slowly incorporating more and more flour into the eggs by moving your fork along the edges of the well. Knead the dough for 7-10 minutes, until the dough is smooth and elastic. When you poke the dough, it should spring back. Wrap the dough in plastic wrap and let rest at room temperature for 30 minutes to an hour, or until the dough does not spring back when poked. Unwrap the dough and cut into 8 equal pieces so that it’s easier to work with. Take 1 piece and wrap the rest in the plastic wrap so that they don’t dry out. Lightly flour your work surface, and begin rolling out the piece of dough into one long piece. Then, fold the top third down, and the bottom third over that, like a letter. Rotate the dough 90˚ and roll the piece back into a long shape. This helps form a more even rectangular shape and makes the dough a little bit easier to work with. Continue rolling out the dough until it is very thin. When you lift the dough, you should be able to see your hands through it. Fold the top and bottom of the rectangle to meet in the middle, then fold over again--this will make the dough easier to cut. Cut the dough to your ideal shape. Loosen or unravel the cut dough immediately, so it doesn’t stick, sprinkle with a bit of extra flour, or semolina, if using. Let the pasta sit out for about 30 minutes to dry out slightly. Take out a noodle and taste for doneness. Once cooked to your liking, remove the pasta from the water, being sure to save at least 1 cup of the pasta cooking water. Add the cooked pasta into your preferred sauce and stir to coat, adding some of the reserved pasta water if needed to add a bit of body and silkiness to the sauce.